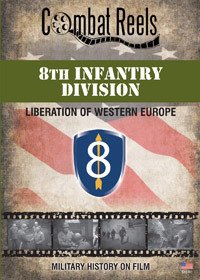 This DVD about the 8th Infantry Division takes place in World War II during the Fall of 1944, Europe. On August 5th, 1944 the 8th Infantry Division, also known as "Pathfinder", had just arrived in Rennes to occupy the city while one regiment, the 121st, was sent to assist with the capture of St. Malo. As a component of VIII Corps the 8th Division held the responsibility to capture the ports on the Brittany peninsula. Our Series II DVD, Liberation of Western Europe begins here and ends at the end of November 1944 as the 8th Division participates in the battle for the Hurgten Forest. The contents of this video show the action as was recorded by the 165th and 166th Signal Photo Companies, during this historic operation. The military history footage in this video is intended to be strictly that of the 8th Infantry Division and only shows other unit footage when two or more units are intertwined. Combat Reels has researched and compiled all of this raw combat film footage, then reformatted it into the DVD format for your viewing pleasure. Great for veterans, families, military historians, and military enthusiasts, this DVD has many different scenes of 8th Infantry Division soldiers. Begin with watching scenes of French civilians thanking and rejoicing with men of the Division. Scenes of a German surrender, medics tending to wounded, a mortar crew firing, and Generals Simpson and Middelton visiting the 8th Div. HQ, are all shown in the port city of Brest, France. In October the men exercise their right to vote while in Luxembourg. General Marshall visits and speaks to officers in St. Vith, Belgium. The series closes with some very scarce footage of actions in the Hurgten Forest. Order your copy today and enjoy these and many more up close shots of equipment, vehicles, weapons, uniforms, helmet markings, and of the faces of the men of the 8th Infantry Division themselves on these candid movie film reels of history, presented to you on popular DVD formatted video! Originally released on 3/25/2009, this DVD has been re-mastered and re-released on 2/7/2014.